Yesterday, NetApp announced that they have entered into a definitive agreement to acquire Solidfire for $875M in an all cash transition. Having spent more than 7 years at NetApp, I thought, I would provide my perspective on the deal . As we all know, NetApp had a 3-way strategy around Flash. First, All-Flash FAS for customers looking to get the benefits of data-management feature rich ONTAP but with better performance and at a lower latency. Second, E-Series for customers looking to use applications side features with a platform that delivered raw performance and third FlashRay for customers looking for something designed from the grounds up for flash that can utilize the denser, cheaper flash media to deliver lower cost alternative with inline space efficiency and data management features. Solidfire gives NetApp arguably a highly scalable block based product (at least on paper). Solidfire’s Fiber Channel approach is a little funky but let’s ignore it for now. Solidfire is one of the vendors out there that has native integration with cloud which plays well with NetApp’s Data Fabric vision. Solidfire has a better story than some of the other traditional all-flash vendors out there around Service Providers which is a big focus within NetApp. Solidfire’s openness around using Element OS with any HW and not just Dell and Cisco (that they can use today). I want to add here that from what I have gathered, Solidfire has more control over what type of HW one can use and its not as open as some of the other solutions out there. And yes, Solidfire would have been much cheaper than other more established alternatives out there making the deal sweeter. I would not go into where Solidfire as a product misses the mark. You can find those details around the internet. Look here and here. Keeping technology aside, one of the big challenges for NetApp would be execution at the field level. The NetApp field sales team always leads with ONTAP and optimization of ONTAP for all-flash would make it difficult for the Solidfire product to gain mindshare unless there is a specific strategy put in place by leadership to change this behavior. Solidfire would be going from having sales team that woke up everyday to sell and create opportunity for the product to a team that historically hasn’t sold anything other than ONTAP. Hopefully, NetApp can get around this and execute on the field. At least that’s what Solidfire employees would be hoping for. What’s next for NetApp? I can’t remember but I think someone on twitter or a blog or podcast mentioned that NetApp may go private in the coming year(s). Although it sounds crazy but I think its the only way for companies like NetApp/EMC to restructure and remove the pressure of delivering on the top line growth especially with falling storage costs, improvement in compute hardware, move towards more software centric sales, utility based pricing model and cloud. From a Tintri standpoint, the acquisition doesn’t change anything. We believe that flash is just a medium and products like Solidfire, Pure Storage, XtremeIO or any product that uses LUNs and Volumes as the abstraction layer have failed to grab an opportunity to bring a change of approach for handling modern workloads in the datacenter. LUNs and Volumes were designed specifically for physical workloads and we have made them to work with virtual workloads through overprovisioning and constant baby-sitting. Flash just throws a lot of performance at the problem and contributes to overprovisioning. Whether customers deploy a Solidfire or a Pure Storage or a XtremeIO, there will be no change. It would just delay the inevitable. So pick your widget based on the incumbent in your datacenter or based on price. If you want to fix the problem, remove the pain of constantly managing & reshuffling storage resources and make storage invisible then talk to Tintri. Contact us and we will prove that we will drive down CAPEX (up to 5x), OPEX (up to 52x) and save you time with the VM-aware storage. While you are at it don’t forget to check out our Simplest Storage Guarantee here . Today, Tintri announced the Tintri VMstore T5000 All-Flash series—the world’s first all-flash storage system that lets you work at the VM level—leading a launch that includes Tintri OS 4.0, Tintri Global Center 2.1 and VMstack, Tintri’s partner-led converged stack. Since its inception in 2008, Tintri has delivered differentiated and innovative features and products for next-generation virtualized datacenters. And we’re continuing the trend with the game-changing All-Flash VM-Aware Storage (VAS). Other all-flash vendors claim all-flash can be a solution for all workloads—a case of “if all you have is a hammer then everything looks like a nail.” Or, they’ll argue that all-flash can augment hybrid deployments, with the ability to pin or move entire LUNs and volumes. No LUNs. 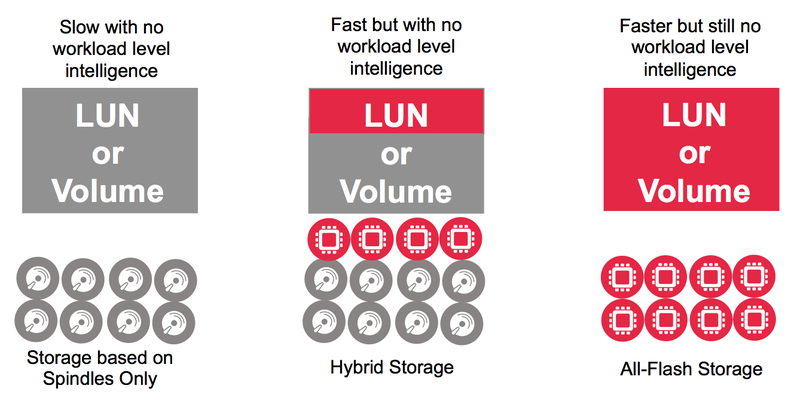 Continuing the Tintri tradition, the T5000 series eliminates LUNs and volumes, letting you focus on applications. We’re welcoming VMs to the all-flash space across multiple hypervisors. Unified management. Aside from standalone installations, the T5000 series can also augment the T800, and vice-versa. Admins can now manage VMs across hybrid-flash and all-flash platforms in a single pool through Tintri Global Center (TGC), with full integration. Fully automated policy-based infrastructure through TGC, with support from vDisk-granular analytics and VM-granular self-managed service groups. With access to vDisk-granular historical performance data, SLAs and detailed latency information, customers can decide which workloads can benefit from all-flash vs hybrid-flash—especially when our hybrid-flash delivers 99-100% from flash. Space savings from inline dedupe, compression, cloning and thin provisioning. NVDIMMs, NTB, 10G and more of the latest hardware advancements. Enterprise reliability exceeding 99.999% uptime. VM-granular snapshots, cloning and replication. vDisk-level Dynamic QoS to eliminate noisy neighbors and ensure peak performance. VM-level Manual QoS to setup performance SLAs through Min and Max IOPs. vDisk (VMDKs, VHDs)-level data synchronization across VMs for test and dev or any operations requiring periodic copying of data. VM-level replication, backup and transfer between Hybrid Flash and All-Flash systems. VM-granular performance analytics with end-to-end latency visualization that includes host, network, storage, contention and throttle latency. Today, Tintri continues our solid roadmap of business-relevant innovations in storage for modern workloads. We changed the game for hybrid-flash—and we’re doing it again for all-flash. Solidfire announced new nodes, a software-only implementation (which oddly comes without complete hardware freedom) and a new program around its Flash Forward guarantee. Pure Storage announced an update to its Flash Array lineup and a program around Evergreen Storage. HP announced its 20K 3PAR line up, basically a hardware refresh. EMC announced software updates to XtremeIO and a lot of other flashy stuff in ScaleIO and DSSD (typical of EMC to think ahead and have multiple bets). NetApp re-launched All-Flash FAS with new pricing to complement the rich data services that ONTAP brings to the table, and has been pounding its chest about how ONTAP is the best thing to happen to all-flash arrays. If we look at most of the announcements, we see a unifying theme: Bigger, Faster, Cheaper and Better. This mostly results from new HW technologies (compute), increasing flash capacities and reduction in the price of flash. From a software standpoint, the newer products are catching up to add all the functionalities that traditional products have had. Traditional products (like HP 3PAR, NetApp FAS) are optimizing the code for flash and taking advantage of their already existing data services and application integrations. From a hardware standpoint, eventually every vendor will catch up to each other as they adopt the newer hardware. It’s like everyone is running out of ideas. None of these vendors have taken a “completely different” approach—and their product can be better than others’ only for a limited time. Eventually, everyone will catch up to each other. If you take the same road your competitors do, your results can’t be much different. But we can’t expect traditional vendors to take a different approach, unless they’re developing a new product without any baggage. But younger product companies definitely have a chance to be different. Still, most of these younger companies have taken a safe approach based on 30-year-old constructs and abstractions that are not required in the modern datacenter—mainly LUNs, volumes that have challenges associated with them. These constructs worked great for some of the traditional workloads but they require a lot of assumptions to be made for architecting storage in a modern datacenter (RAID Group size, Block Size, Queue Depths, LUN/Volume sizes, Number of LUNS/Volumes, number of workloads per LUN/Volume, grouping based on data protection needs etc.). Modern workloads are no longer tied to LUNs/Volumes which also poses a huge problem especially for architectures that are designed with these constructs in mind. Now, because the traditional vendors and the younger vendors used the same approach, it has become a contest between the two – Traditional vendors are trying to optimize their product for flash, and newer vendors are trying to add functionality to match up to that of traditional vendors. As I see it, the scale is heavier on the traditional vendor side as far as storage with a traditional approach is concerned—because instead of changing the game, the younger vendors decided to play the game of traditional vendors. Historically, the startups that make a difference are the ones that take a different approach. Data Domain, for example, defined a new model for backups. Even NetApp took a filesystem approach to storage (for file and block), enabling a completely different implementation of technologies like snapshot, clones, dedupe (primary storage) etc. Now everyone has started to have some sort of filesystem layer, and have caught up to the extent where the lines are all blurred out. NetApp is feeling the pressure now, but it took a long time for vendors to get there. There are many other examples, including ones even outside the storage industry (think Uber, Airbnb, Facebook). While starting out different is great, it is important for any vendor to stay different and keep reinventing itself (through acquisition or innovation) based on changing needs. They should not get bogged down by a “things are working well, why change anything?” mentality. Being different changes the possibilities and gives a chance for products to stand out. It allows companies to change the game and the table stakes. It allows companies to ‘change the experience’ which is what we use to evaluate any product. As far as the all-flash market is concerned, there is a need for a product with a different approach. A product that can change the game and bring new possibilities. The need is for something designed from the ground up for the modern datacenter (and modern applications), rather than something that is just designed from the ground up for flash. Flash is just a medium, and mediums change. It’s Flash today, it may be something else tomorrow. Last few weeks have been great in terms of industry recognition of how Tintri has been approaching the storage problem for virtualized workloads. First, VVOLs go GA and validates the approach Tintri took 7 years back with VMstore in terms of removing the boundaries around LUNs and Volumes in virtualized environments and come out with a product that delivered VM centric Storage Platform around 4 years back. The result is 4 years of product maturity (and 4 years of lead) based on real world deployments. Now we have Pure Storage announce an integration with VMTurbo that allows customers to use VMTurbo in combination with Pure Storage to automate the movement of VMs from one LUN to the other based on various conditions including performance and latency. Enterprises today are moving towards a Private Cloud based model for running their IT Infrastructure or they are looking at Public Cloud for some of their select workloads. One of the key requirements of deploying a Private Cloud or consuming the public cloud is Chargeback or Showback. 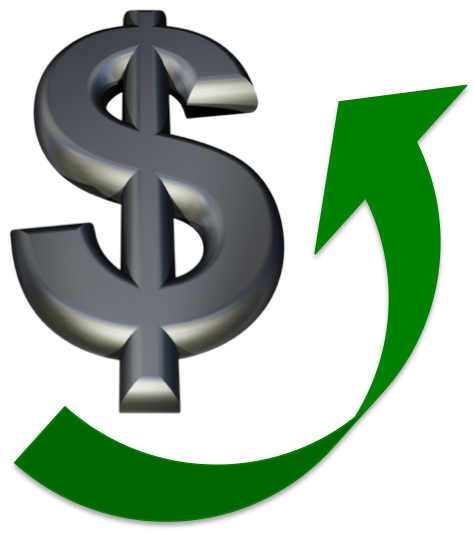 As we know, with Chargeback, the IT Department/Service Provider hands over a formal bill to the Line of Businesses (LOB)/Customer to recover costs of delivering the service to them whereas with Showback, there is no exchange of any Bills or money.With Showback, IT just tries to introduce a culture of Cost Awareness, Cost Justification, Capacity Planning and Awareness. The model chosen by different enterprises depends on policies and objectives that different Enterprises have. Both Chargeback and Showback require some definitive metrics at various levels based on which the overall cost can be measured for delivering a service. Here the discussion will focus on the Data Storage side of the equation. How does Tintri deliver 99% IO from Flash? This comes up a lot in my conversations with Customers, Prospects and Partners. Delivering 99% of the IO from Flash is one of the biggest differentiators for Tintri that allows us to maximize the value of Flash, delivering sub millisecond latencies to workloads. One of the toughest jobs for any product that has both spinning disks and Flash is to keep the Flash filled with meaningful data in order to maximize the IO from Flash. This is something that the engineering teams really struggle with, resulting in products that deliver less than 50% IO from Flash in real life situations.